Confession: I’ve been California dreaming this week - big time! For those who don’t know, my husband and I lived in Southern California for five years before we moved to Chicago. Many of our weekends were spent exploring all of the different towns along the coast. It was pretty amazing to live near the ocean - we lived in Newport Beach & Manhattan Beach - and we got to take in the scenery every day! When visitors came, we usually ended up taking them to Malibu for a day. I came to SoCal having many assumptions of what I thought Malibu was: touristy, fake, over-the-top. Let me tell you, it is none of these things! I absolutely love the Malibu coastline, but I love the Malibu canyons even more. I also got to know the Malibu wines, which brought me to these wonderful spots. 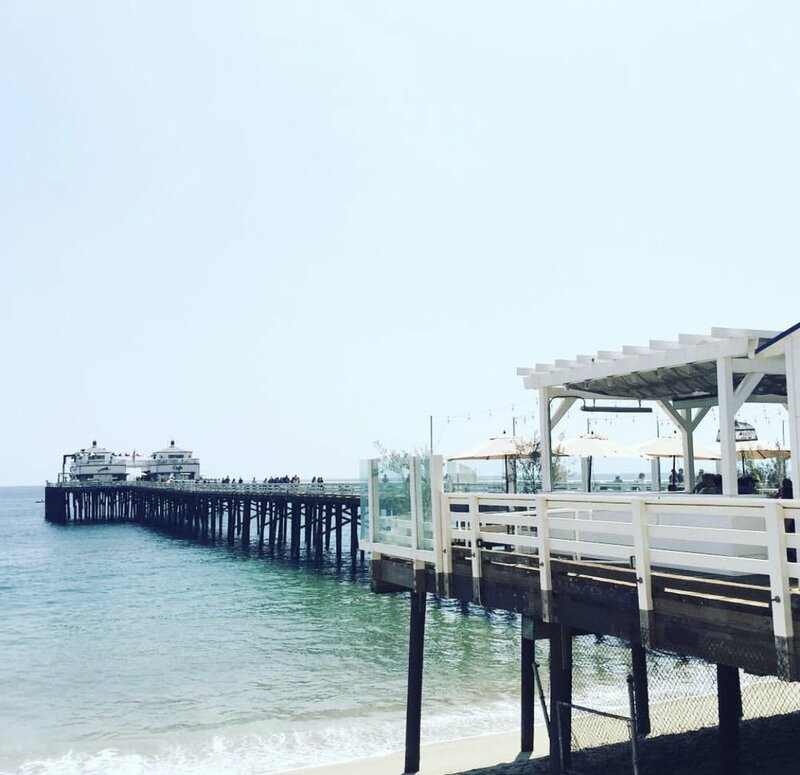 After spending plenty of weekends in Malibu, here are my favorite spots and recommendations. Whether you are planning a trip to the West Coast or not, these spots will make you want to book a flight to LAX stat! Malibu is located in LA County. Whether you fly into LA or make the drive from another part of SoCal, driving up and down the coast is a must! Take PCH - Pacific Coast Highway - (also known as Highway 1) either north or south to soak in those coastal views. We were typically coming from Orange County, which was just south of LA County. From the OC, it will generally take 1.5 hours with traffic. The drive is considerably improved if you’ve rented a convertible or roll down the windows and let that sunshine stream in! If you’re coming from the south, once you pass Santa Monica you are almost to Malibu. You’ll start to see the quaint shops and restaurants lining the coast. Coming from the north, PCH cuts inland around Ventura, but once it cuts back to the coastline, you’re in Malibu. Plan to pack a few picnic supplies if you are doing a day trip. I usually packed a beach blanket, a picnic basket with napkins, plates and cups (for wine), a few snacks (crackers, cheese, veggies), and some sunscreen. Plus, always have a hoodie or sweater - there tends to be a chill in the air in the canyons and the evenings are always a bit cooler than the days in California. Add in some good tunes (maybe a portable speaker) and you are ready! If you are coming from the south, you will pass the Malibu Pier before you hit the canyons, so it makes for a good first stop. Depending how early you hit the road, you could stop here for late breakfast or lunch. There are two options: either the restaurant (at the beginning of the pier) or the cafe (at the end of the pier). Both offer different menus, so take a look on their website. The food is all farm-to-table. They have an amazing cookbook that I purchased last time I was there. The place is casual, but with gorgeous views of the water and Malibu. We attended a rehearsal dinner here and fell in love with it! This is the perfect stop along the coast to stretch your legs before you head into the canyons. I know it’s hard to peel away from the gorgeous coastline, but trust me on this. The canyon drive is just as gorgeous. There are a few different routes you can take. But I suggest turning off onto Kanan Dume Road. Once you start into the canyons, don’t forget to look behind you for some awesome shots of the ocean and coastline from above. You’ll see some awesome look-out spots along the drive. From here, it’s about 8 miles to the first stop, but the road has lots of twists and turns, so plan for 20-30 minutes. The drive is part of the experience! Word of advice: cell service tends to cut out a bit in the canyons, so roughly plan out your route before you start the drive. Everything is pretty well marked, but those back canyon roads can come up quickly! Saddlerock Ranch - or Malibu Wines - is one gorgeous piece of property. There are weddings here almost every weekend. You can go on a Wine Safari - where you meet Stanley the Giraffe, zebras, and all sorts of other animals. All while you sip wine, of course! There are wine hikes. I’d plan to book those activities ahead of time. Or you can simply relax at a table in the wine tasting area. If you’ve eaten lunch already, this is the perfect next stop! If you haven’t, then plan to bring your picnic and snacks with you because they typically don’t have food on-site. No matter what you choose to do here, I guarantee you will have a great time. Plan on spending at least two hours here before heading to the next stop. One of the friendly animals we saw on our Wine Safari! 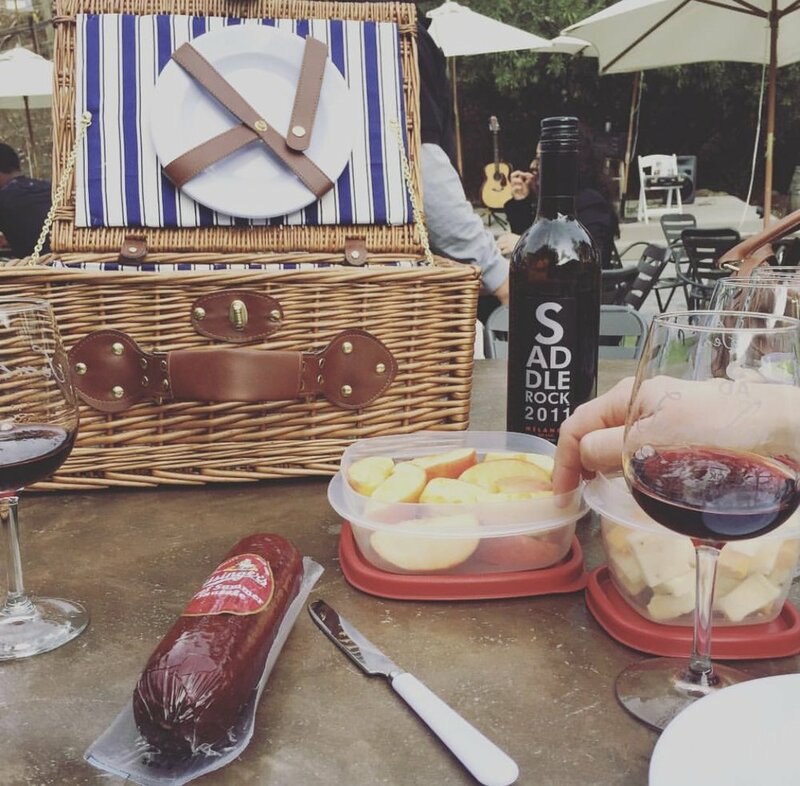 Our picnic lunch and Saddlerock Wine - yum! This place is near and dear to my heart. Malibu Cafe was my all-time favorite spot for the five years we lived in California. I took everyone here when they came to visit - no matter how bad the traffic was :) Coming from Saddlerock Ranch, Malibu Cafe is only two miles down the road, so the drive is very easy. After some wine tasting, you’re probably starting to think about an early dinner or at least some appetizers. Malibu Cafe has a wonderful menu. But it is much more than a restaurant. Tucked into the canyons on the larger property of Calamigos Ranch, there are lots of different areas to explore. From the moment you park, you’ll notice twinkle lights dripping from the trees. There are picnic tables all over, with people enjoying wine and live music. There is a small pond and you can take a paddle boat out for a spin while you wait for your table. Whether you plan to stay for dinner or not, there is an outdoor bar, a fireplace, games like corn hole and a pool table (yes, outside). They recently added a few shops that are fun to check out on your walk in. This is a must do, in my opinion. My husband worries that I oversell it, but nobody is ever disappointed! I will say, it has become a bit more popular over the years, so you may have to wait a while for a table. But if you plan ahead and come with time to spare (and not completely starving), you will love the whole experience. The scene at dusk at Malibu Cafe never gets old! View from one of the shops at Malibu Cafe. If you’re visiting in the winter, the sun has likely set by the time you get to this last stop. But if you are here in the summer, it is a good idea to venture out of the canyons and catch sunset back on the ocean. Rosenthal is located about 20 miles from Malibu Cafe, so plan on a 30 - 40 minute drive. You’ll be headed back to the coast and south (a little past Malibu Pier). Rosenthal is located right off of PCH, so you can’t miss it! You’ll get some great views of the sunset over the ocean. There is typically live music and plenty of rose to go around. Just like Saddlerock, last time I checked there was not a restaurant on-site. So those snacks may come in handy! On the weekends, I have seen food trucks parked at the winery, which sounds like the perfect pairing. The vibe here is beach casual and it is a great end to a great day in Malibu! Famous for their Surfrider Rose! That’s all folks! I hope you use this guide for your next trip out to Southern California. Even if you only check out one of the spots on this list, I promise, you won’t be disappointed.